A few weeks ago, my friends and I went to the Horticultural Building at Lansdowne in Ottawa for the Ukrainian edition of Ottawa Welcomes the World. We were treated to two great sets of live music by some of Ukraine’s finest, ONUKA and Mad Heads… for free. Ottawa Welcomes the World invited embassies and high commissions to mark their country’s national celebration in Ottawa with free events which highlight their nation through food,art, music and more. I had no idea about these events and I have clearly missed out on a lot of really fun days and nights, but lucky for me my buddy invited me to go check out Ukraine. The evening started with a sand art performance where the artists moved sand around on a back-lit platform creating beautiful images to tell the story of Ukraine and Canada’s connection. All of this accompanied by a violinist. It was very impressive and visually stunning. Mad Heads, from Ukraine, performing at the Horticultural Building in Ottawa. After a few speeches from very distinguished guests, including the ambassador to Canada, it was time for the music. Up first was Mad Heads—a ska band and the reason we were there. Little did I know they had been performing and releasing music for over 25 years and 8 studio albums. They were high energy and a lot of fun. I didn’t understand a word, other than their cover of “Don’t Worry, Be Happy,” but their music was infectious and had us dancing. 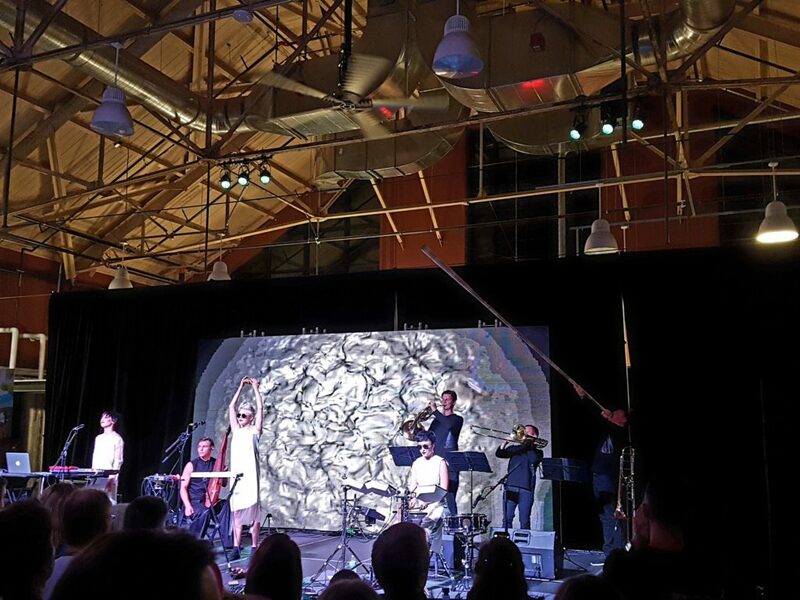 ONUKA, from Ukraine, performing at the Horticultural Building in Ottawa and putting their big “horn” on display. Headlining the night was ONUKA. ONUKA, which means granddaughter, are an electro-folk act and were introduced as a band with chart-topping hits all over Europe. The band has four main members, a singer/wind instrumentalist, keyboardist, percussionist and a banduryst (which is one of the coolest looking instruments ever with so many strings). For their live performance they also had a three piece brass ensemble with a french horn and two trombones. During some songs one trombonist switches to this massive 10 or 12 foot horn. All of this was performed in front of an ever changing video screen ranging from the abstract to animals. All that to say that it was quite a sight to see and even better to hear. One of the most touching and heavy moments was when they performed a song “Vidlik.” Lead singer Nata Zhyzhchenko simply introduced the song saying “let’s all pray for the victims of 1986,” which was a reference to the Chernobyl disaster, the biggest disaster in the country’s history. All the great music was complimented by traditional Ukrainian food, including perogies and cabbage rolls, as well as Lvivske—a Ukrainian beer which traces its roots to a monastic beer of 1715. 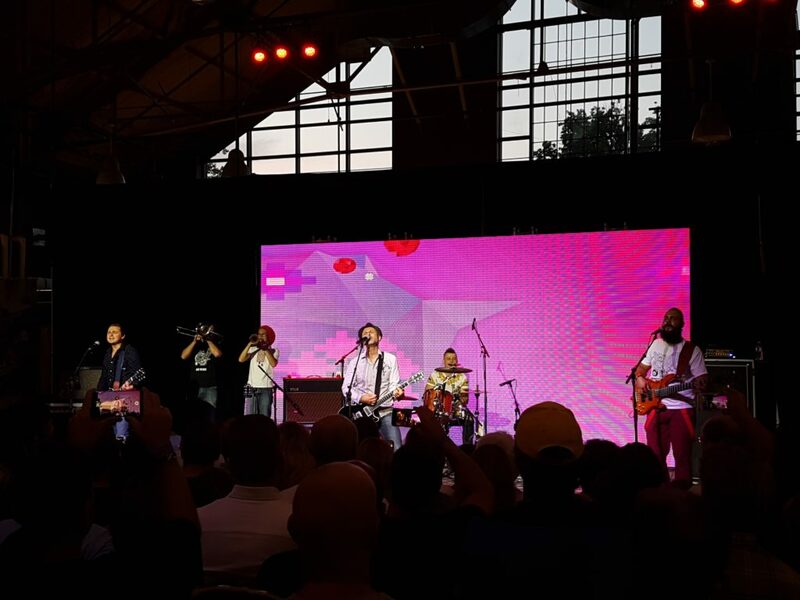 It was an amazing night and of this is a sign of what to expect from other Ottawa Welcomes the World events, I strongly encourage you to check them out.